The vortex lens is unique because it has spiral-phase steps machined into the curved surface. This spiral pattern controls the phase of the transmitted beam. When the spiral steps are machined into a curved lens surface, they produce a focused beam with zero energy or power in the middle. In other words, the vortex lens produces a ring focus. One other focused beam feature is that the phase is spiraling as the beam propagates; therefore, it’s sometimes called a spiral lens. Traditionally, these lens types were produced using diffractive elements. Now they are machined directly with diamond-turning techniques. The result is a precision spiral step or vortex lens that can produce a ring focus. Vortex lenses are made from any type of diamond-turnable material. For use at 10.6µm, this includes materials such as ZnSe and Ge. It is also possible to put this surface on a reflective mirror such as Cu or Al. 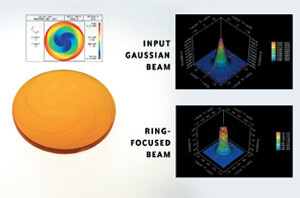 Provides a unique optical surface for producing a spiral-phased focused beam. Spiral phase at focus produces a ring mode. Can be used in ring-focus applications.